Suitable for various indoor applications such as showroom, commercial places, offices, shopping areas, passages etc. Suitable for Armstrong / Luxalon / Gypsum board / POP ceiling. Recess mounting down light fixture with powder coated frame fitted with anodized aluminium reflector. 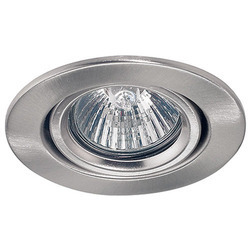 Our firm offers a wide series of LED Recessed Light Fixture. Professionals make this product as per worldwide industry norms and standards. We are the reputed name of market, known for offering a customers’ specific assortment of Modular Recessed Lighting Fixtures. - Recess Mirror Optics PMX (P5)-336 (2-2). indoor decorative suitable for two or three 36 watt CFL recess mounting with pre anodized aluminum reflector. Surface and recess mounting fittings. Suitable for indoor applications use in residential areas, shopping areas and pedestrian areas as decorative wall guide light.